Layout of a learning activity as presented to a pre-pilot teacher. Creating a product or a plan etc. For this pre-pilot, teachers also need to create a lesson plan together with another teacher that benefits both of their classes. 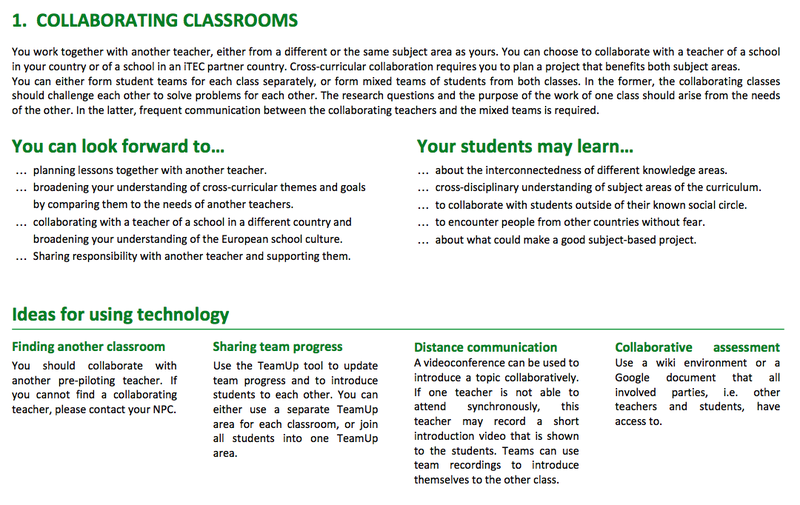 To make this easier for the teachers, we provided them with themes to consider when planning their pre-pilot activities. The themes are inspired by the cycle 2 scenarios, and include Environment, Business plan, Building on misconceptions, Students create science learning resources, Multi-cultural and multi-lingual learning of maths, Personal exam preparation, Researching online social behaviour, Students and teachers learn together and Learning centered browsing. This entry was posted in For teachers, News and tagged cycle2, pre-pilot. Bookmark the permalink.